Teeth requires root canal when the pulp of the tooth has been pathologically involved through decay or periodontal infection such that the pulp is progressively dying or already dead. The pulp in this context refers to the nerve and blood vessel supply of the teeth, which provides sensation and nutrients to the teeth. When bacteria invades the root canal system, it slowly colonize the area to eventually infiltrate the whole canal and causing death of the pulp. Bacteria can still grow on dead pulpal tissue, allowing precipitation of more toxins and causing an infection, which can spread outside to the underlying jawbone and supporting tissues. Despite the nerve being dead, the surrounding tissues still possess neural innervation and this contribute to the pain perception when infection associated with a necrotic nerve is involved. What can I do to avoid root canal treatment? Thus to prevent and avoid root canal treatment, regular checkups with your dentist is necessary to pick up problems in your teeth while it is still in the early stage. It is not uncommon for chipped or decayed teeth to be left unattended for many months, as they often do not cause great amount of pain. It is often until the problems gets closer to the nerve of the tooth, where the nerve starts to get inflamed, that the pain gets more intense and people start to notice it a bit more. 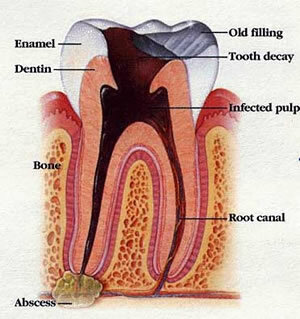 But at that stage, the health of the pulp may already been severely compromised that a root canal may be inevitable. Hence it is important to seek dental care as early as possible when you experience symptoms to ensure that it is managed appropriately early on because the longer you leave it, there is a potentially higher chance that it can be pulpally involved. Dental decays that are very deep, in particular, are at significant risk of pulpal involvement and often patients are warned regarding the potential need for root canal treatment down the track after a deep filling has been placed. The tooth generally will be tender for a few days after deep fillings but should not get worse or last for more than a week. 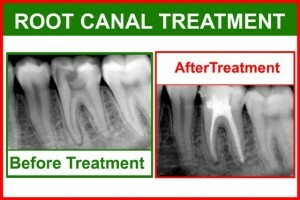 If it does, it is very probable that it will require root canal treatment. This reiterates the importance of regular dental check ups to prevent progression of dental decay beyond where it needed to and avoiding the need for root canal treatment. The main culprits behind dental infections are bacteria associated with dental decay and sometimes, periodontal diseases or gum diseases. Hence to prevent the need for root canal treatment, it is important to maintain good oral hygiene in terms of tooth brushing and flossing to prevent tooth decay and periodontal problems in the first place. Periodontal disease has more of a secondary effect as it can sometimes allow passage of bacteria into the root canal where the pulp is through lateral root canals or the apex of the tooth. This is attributed to the gradual bone recession around the tooth, which expose those openings. Gum recession is not necessary as bacteria can easily slip underneath the gums therefore it is important to note that the tooth may not necessarily look terrible clinically and this often can be very misleading. Prognosis of such teeth, especially with severe periodontal disease that extend all the way to the end of the root of the tooth (i.e root apex exposed to bacteria) are poor and usually cannot be salvage even with root canal treatment. It is usually more appropriate to extract such teeth. There are times where the morphology of teeth can make it more susceptible to root canal treatment such as a condition known as dens evaginatus or talon’s cusp. This tooth anomaly manifests as an extra bump on the outer surface of the tooth. This bump usually consists of only a thin layer of enamel covering the over-extension of pulpal tissue and can be easily chipped off during function, hence premature exposure and involvement of the pulp. Preventive restorations can be placed over these anomalies to make them less prone to fracture, avoiding the need of root canal treatment.